Mavic’s all-new Cosmic Carbone 40C: The first truly safe carbon clincher? PEILLON, France (VN) — Mavic has a dual history of daring moves and odd conservatism, with absolute winners and horrible flops coming from both ends of that spectrum. The original Helium, for example, was so far out of the custom-built norm that it was an assumed failure before it ever hit stores. Of course, it changed the way we buy wheels forever. On the other side it has Zap and Mektronic, which barely got out of the starting gate. In a way, they still can’t, at least not by our usual definition of a carbon clincher. But apparently neither can anyone else, sending Mavic in a wholly distinctive direction. The all-new Cosmic Carbone 40C isn’t a full-carbon clincher as we know it; it’s another hybrid. But unlike the previous Cosmic Carbone versions, the new wheels no longer use a heavy aluminum brake track. The 40C features an aluminum core, one that is far too flimsy to be used as a rim on its own, and wraps it with carbon. It is intended to solve the heat and other issues that have always been associated with carbon clinchers, while adding minimal weight. Carbon clinchers can provide vastly superior aerodynamics, the sort unavailable to an all-aluminum wheel without a massive weight penalty or the hassle of gluing tubulars. Plus, they look exceptional. Between these few factors we find the motivation for the their ever-increasing market share. But they also have problems, and always have. A more detailed evaluation of the genre as a whole was published on our Web site this morning, but the rundown is simple: carbon does not move heat well, resulting in overheating, nor does it brake well, resulting in excessive and unwanted forward motion, particularly in wet conditions. 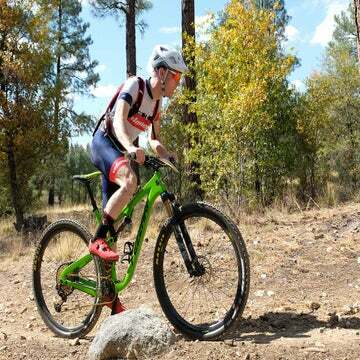 In addition to these safety concerns, carbon clinchers, due to various design constraints, are always significantly heavier than their tubular counterparts, and are often heavier than all-aluminum wheels, yet cost two to three times more. The consumer value is often just not there. Like every other wheel company on earth, Mavic wanted to solve these problems. They took a particularly slow approach to doing so, holding out for years until the company could finally create “the first reliable carbon clincher,” as road product manager Maxime Brunand put it. At first glance (and that’s a very important qualifier), they may have done just that. The French company set up a two-pronged attack on the bane of every carbon clincher’s existence: heat. The first is the use of a proprietary combination of multiple high-temperature resins called TgMax. Frankly, this is nothing unusual or groundbreaking. The big names in carbon clincher tech, companies like Zipp, Bontrager, and Reynolds, have been using these sorts of resins for some time. Mavic obviously says its own version is better, but we have no way of confirming this. The second is far more interesting. Mavic builds the 40C around an aluminum rim core, essentially turning its carbon clincher into a hybrid clincher. The idea is that the aluminum part of the rim, which makes up the whole rim bed and bead hooks, but not the brake track, more effectively dissipates heat while also maintaining improved strength in multiple directions. Each ply of carbon fiber is only strong in one direction, while aluminum’s isotropic nature means it has equal strength along all axis. That means that an aluminum clincher rim holds air pressure better and resists brake force better, both of which result in improved brake track geometry (no pulsing). To get the same strength out of carbon, manufacturers are required to use vast quantities of carbon in a multitude of directions. That’s why they’re not exactly light. The connection between the carbon and aluminum surfaces is apparently chemical, not mechanical, meaning it will only get stronger with time. We’re not exactly sure how that works, not being chemical engineers, but will have to just trust Mavic on this one. The result is a rim that sees only a marginal weight penalty, if any at all (Mavic claims that its wheels have lower inertia figures than Zipp’s 303 Firecrest Clincher, suggesting rims of similar weight), and are extremely unlikely to fail catastrophically as a result of excessive brake heat. A win-win situation, we think. The final, but no less important issue with carbon clinchers is the brake surface itself. These have come a long way in recent years, with the latest from companies like Zipp and Bontrager hitting impressively high marks for stopping power and modulation. 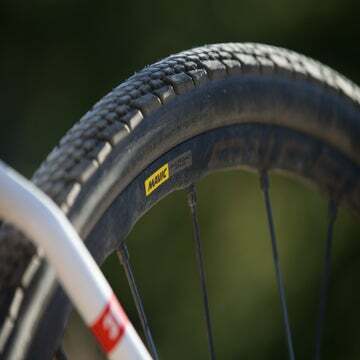 Mavic’s solution to the heat problems do help braking in that the rim is less likely to massively overheat, but most brake situations get nowhere near that mark. So simple, everyday brake pad friction becomes the primary concern. Mavic’s tactic has been to add a proprietary surface treatment to its brake tracks in order to get them a bit closer to the power found on an aluminum rim, much like Enve does. The treatment is part of the carbon or resin itself, apparently, so will last the life of the rim. Watch this video put out by Mavic that illustrates how the wheel is manufactured (French with English subtitles). Braking distance (unknown test parameters): 45 meters for Mavic, Reynolds and Zipp take 90 meters in wet conditions. Whatever the brake track treatment is, it works, and works well. It was immediately noticeable on our test ride in the Maritime Alps just outside Nice, France, which started with a seven-switchback descent out of the town of Peillon, near the Col de la Madone. The Cosmic Carbon 40C proved to be among the best carbon clinchers we have ever had the pleasure of stopping on. The heat-induced fade we’ve found on Zipp, Bontrager, and Reynolds wheels was absent. Power was acceptable, and decreased only very slightly as we ran through water on the way down the Col de la Madone. It’s impossible to evaluate aerodynamics without a wind tunnel, but a few coastal breezes didn’t buffet the slightly wider 40C around. We’d wager that the wheels still fall a good ways behind the Zipp 303 in the tunnel, though. The wheels feel plenty stiff, and since I was riding my own bike I feel more comfortable with that statement than I usually do at these launches. The feel is similar to a Ksyrium, but the wheels are not as stiff as a set of Cosmic Carbone Ultimate tubulars. The weight, too, felt wholly acceptable. I’ve never had a carbon clincher that truly impressed me with its acceleration; none of them are light enough. The 40C continues that trend. They feel similar to a Zipp 303 Firecrest clincher, and seem to spin up a bit better than the Bontrager D3 50-mm wheels I was most recently on. But honestly, none of the information in the last two paragraphs is really the concern here. Mavic seems to have created a wheel with few drawbacks relative to its full-carbon cousins, while drastically improving safety. The company apparently ran 30 wheelsets under 30 different riders for a minimum of 10,000 kilometers each without a single failure, or even an out-of-true wheel. Seems unbelievable, but the PR folks were adamant, and they generally don’t lie about things so easy to look into (except claimed weights, for some reason). Even if that’s an embellished story, the reliability looks to be truly impressive — and as the first carbon clincher we feel comfortable saying that about, Mavic may have just set a new bar. We’ll be on a set for a long-term review in mid April. Check back, and see if the Mavic Cosmic Carbone 40C lives up to its launch marketing, or if all that we’ve hoped has come to naught.